The mother of a Tamil political prisoner wept as she told a news conference of her son's plight and how the family continue to be harassed by military intelligence officers who arrive at their home. 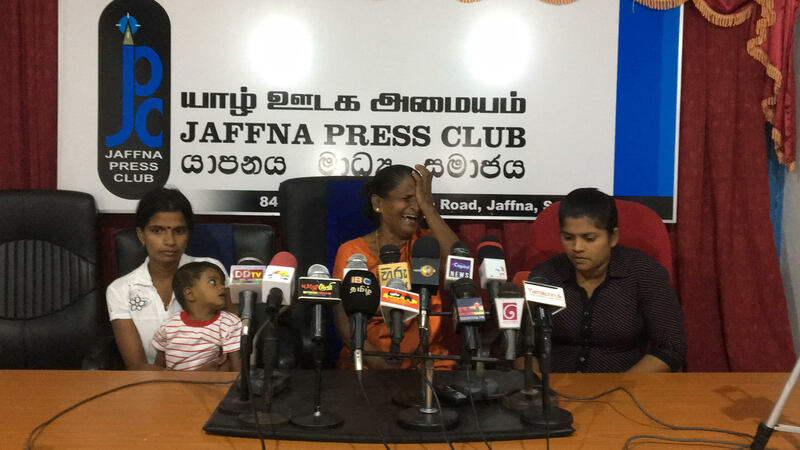 The mother of S Jeyachandran spoke at the Jaffna Press Club today and explained how her son, who is currently one of the political prisoners hunger strike in protest against their ongoing detention, was re-arrested despite being 'rehabilitated'. Speaking to journalists Jeyachandran's mother explained how her son was detained and released from 'rehabilitation' on April 5, 2010. However on September 20 later that year, state security officers arrested him again and took him to the Terrorism Investigation Division's fourth floor office in Colombo. He was later taken to Boosa camp, before being transferred to Anurathapuram prison. "The police have filed a fake case against him," the political prisoner's mother told reporters. Eight Tamil political prisoners at Anuradhapura prison, M Sulaksan, E Thiruvarul, S Jeyachandran, R Rupan, S Thillairaj, E Jegan, S Sivaseelan and T Nirmalan, launched a hunger strike this month demanding they be released following a quick rehabilitation. A number of Tamil political prisoners remain in prison for years without charge under the Prevention of Terrorism Act (PTA). Tamils across the North-East have called for them to be released.